You could be looking at the first original character to make it into Tekken 7. 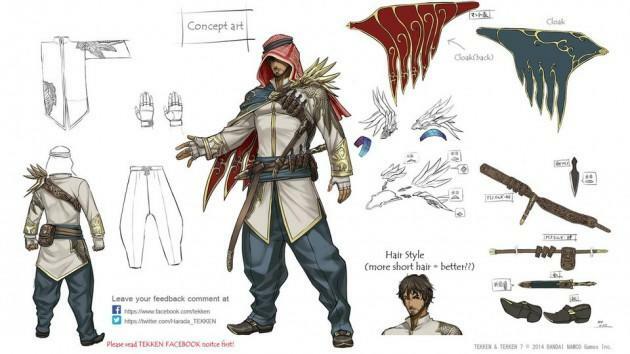 On Tekken’s official Facebook page, game director Katsuhiro Harada posted his concept art of his new Arabian character, but was waiting for advice and the reaction of Tekken‘s Middle Eastern fans before moving through with his inclusion. Harada states that Bandai Namco has been wanting to include a Middle Eastern fighter since 2008, but the lack of exposure to modern day fashion couldn’t allow them to “fully design it back then.” Since several Bandai Namco tournaments have been held in Dubai since then, he and his team have decided to move forward with it. “If the Tekken fan community, especially those in the Middle Eastern area, end up liking this character, I would like to feature this character in the game,” Harada said. Bandai Namco received a little heat with Tekken Tag Tournament 2 for a stage that had the Arabic writing for Allah, and Harada quickly apologized. No doubt him reaching out to the community is to find the best way to make an inoffensive character. So far, the Facebook page is filled with positive support from Tekken‘s Middle Eastern fans, and it’s filled with constructive criticism. I like the idea and the character design, but he comes off a little too much as an Assassin’s Creed character. Tekken 7 will be developed for the PlayStation 4, Xbox One and PC using the Unreal Engine 4.